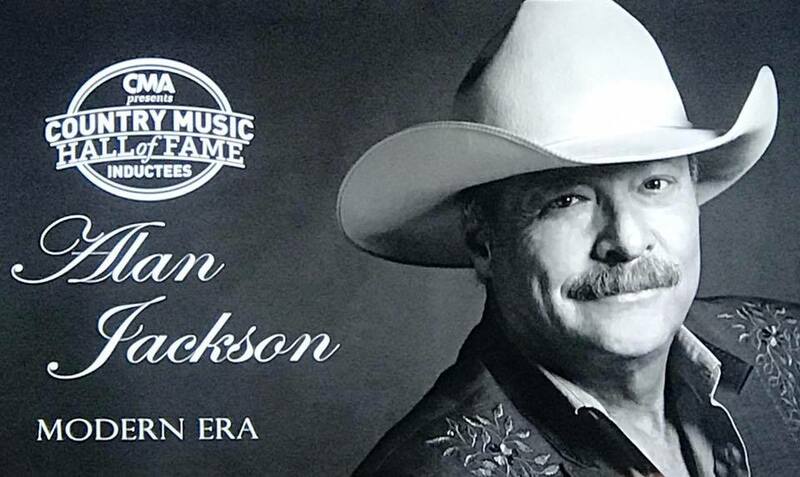 Alan Jackson is the new “Modern Era” inductee into the Country Music Hall of Fame. The announcement came Wednesday morning (April 5th) at a press conference in the Hall of Fame rotunda in Nashville hosted by Hall of Famer Vince Gill. Alan Jackson chuckled at having his career characterized as “modern,” since his time in country has been marked as one of the mainstream’s staunchest traditionalists. One of the biggest superstars in country music history, and one of the genre’s most uncompromising supporters of the traditional roots of the music, Alan Jackson deserves the Country Music Hall of Fame distinction as much as anyone from the modern era. With an astounding 60 million records sold worldwide, thirty-five #1 hits, fifty Top 10 hits, two Grammy Awards, and 16 Country Music Association Awards including Entertainer of the Year in 1995 and 2002, his career could be couched as Hall of Fame worthy, and then some. The 57-year-old Jackson was born in Newnan, Georgia, and grew up on Gospel and the music of artists such as Gene Watson and John Anderson. At the age of 27, he moved with his wife to Nashville to pursue music as a career. In a classic story of climbing the country music ladder, Jackson’s career started as a mail boy in the offices of TNN. Glen Campbell helped get Jackson’s singing career started, and by 1989 he was signed to Arista Nashville. Albums like Don’t Rock The Jukebox and A Lot About Livin’ (And a Little ’bout Love) awarded Jackson many hits and massive commercial success, but unlike many of his early and mid 90’s contemporaries, Jackson mostly stayed true to his roots and kept it country, earning acclaim both from the industry, critics, and older artists. Jackson settled into his career into the 2000’s, and became know as a staunch, outspoken opponent of the abandoning of country’s roots present in the genre at the time. Jackson launched a famous protest in 1999 when the CMA Awards asked George Jones to perform an abbreviated version of his song “Choices,” and along with George Strait, he cut the country protest song “Murder On Music Row” in 2000. Today, Alan Jackson has settled in nicely as a legacy act that still has great respect and clout with younger artists. His 2013 offering The Bluegrass Album ushered in an era where Jackson is reconnecting with his roots, while still remaining a commercial force in country music, and his 2015 album Angels & Alcohol gave him yet another #1 record. Though it took a few years of eligibility for Jackson to make it, he was considered a shoe-in for the distinction. The other 2017 Hall of Fame Inductees were Jerry Reed in the Veteran’s Era, and Don Schlitz in the Songwriting category. All the newest members will be formally inducted in a medallion ceremony later this year.